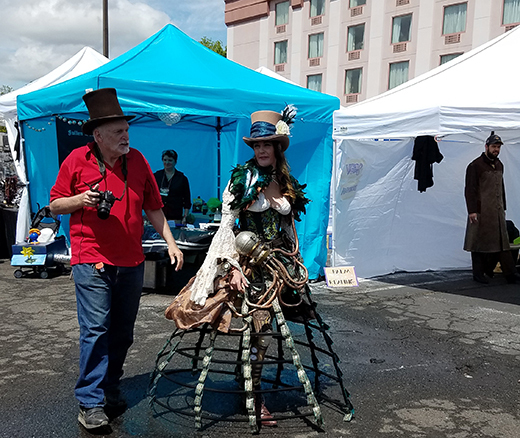 Jeff Mach has been hosting the SPWF since 2010, but the concept of Steampunk, that mix of space-age science and steam-age technology,goes way back to April 1987, when writer K.W. Jeter came up with the name to describe the category of that Victorian fantasy literature. Held annually the SPWF has grown so large that it now takes over two hotels, The Embassy Suites and the Radisson in Piscataway NJ – as well as the large courtyard between the two hotels, where a performance stage and vendors of antiques, crafted items and curiosities line a fairway where bizarrely costumed attendees can promenade. 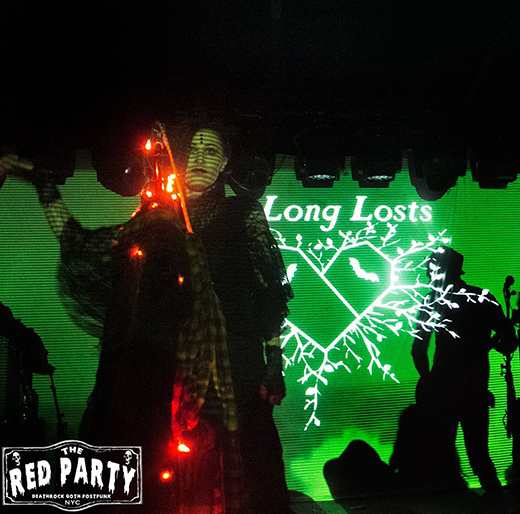 The Red Party held its 10th anniversary celebration on April 8, 2017 at Manhattan’s Mercury Lounge, its current home hosted by Mother Goth, Mandana Banshee Templar. Starting out as a dedicated Goth club at 200 Orchard St in NYC’s Lower East Side, bucking the then-trend of synth-pop and EBM, the Red Party made its way to Le Poisson Rouge for a while, then took up residence at Mercury. In the meanwhile, Communion, the Limelight, the Bank, the Batcave, Absolution, CBGB’s and CB’s Gallery left the scene. The original Red Party deejays, Sean Templar, Jarek Zelazny were joined by Peter Holikaris Holik from SWitzerland for the anniversary event. The setlist consisted of a strictly curated mix of Goth, Post-punk and Deathrock in keeping with the histoprical theme. 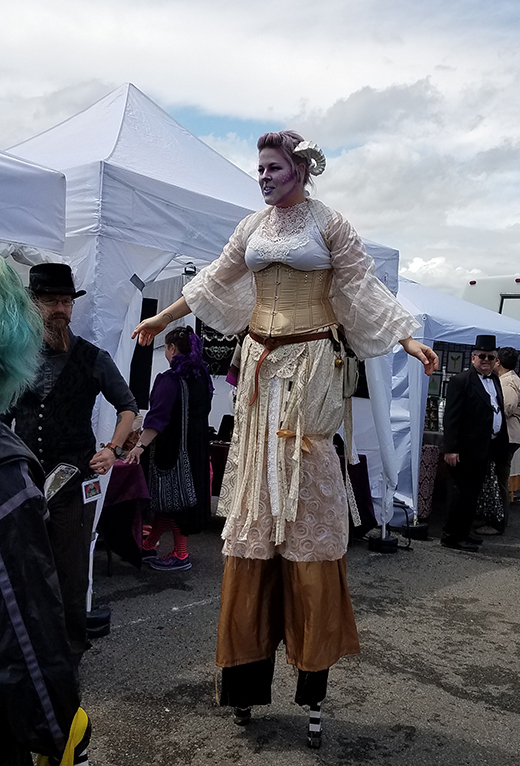 A live performance by The Long Losts , represented by the couple, Anka and Patrick created the highpoint of the celebration, bringing their year-round Halloween style to the party. 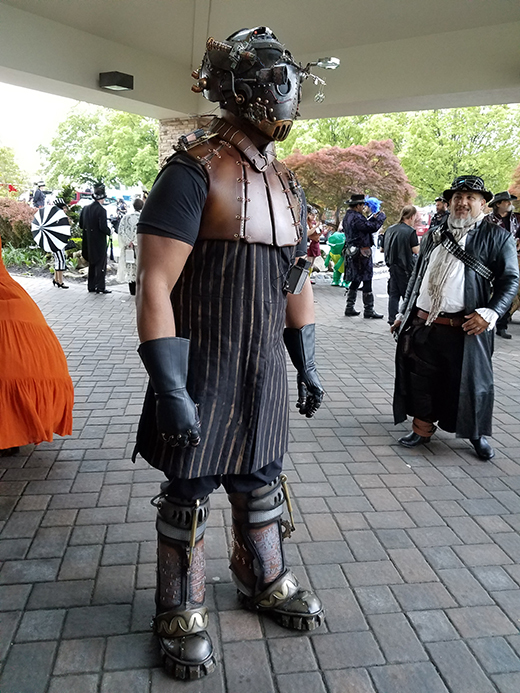 Look for them at the upcoming Steampunk World’s Fair. 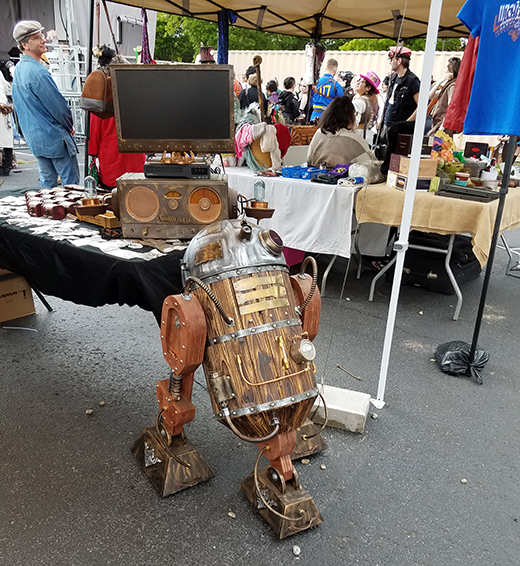 The Aquarian and Weird NJ held their several-times-a-year odd-ball flea market at the Wellmont in Montclair on April 15, as they have been doing for a couple of years now, featuring vendors of offbeat crafts and collectibles, music and clowns . Stationed outside are a variety of food trucks and an entourage of eccentrically clad patrons, promoters and curiosity-seekers. Grainy footage and trailers from classic horror movies and cult films shown on the stage big screen overlooking the market as one wends one’s way through the various levels and aisles where books, custom-printed pillows, scented soaps, homemade sweets, second-hand garments, hand-made accessories and punk-art pieces are sold. Alcoholic and soft beverages were dispensed by bartender Ike. 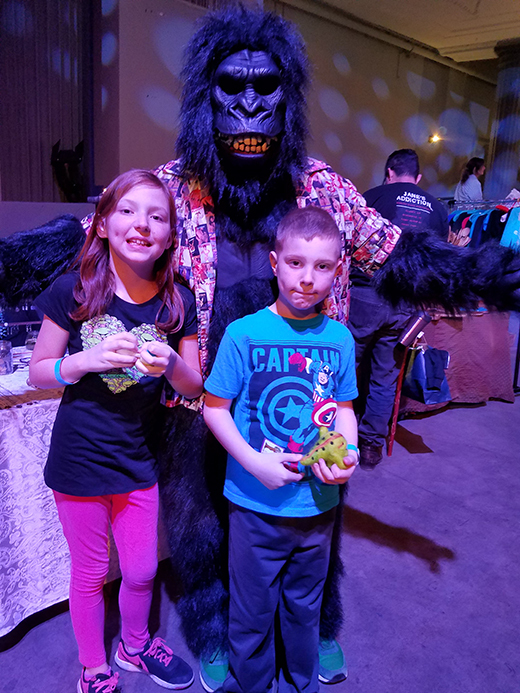 A towering Easter bunny and a jovial, horn-honking, costumed gorilla mingled and posed for photos with guests. Robert Ripley started this venerable franchise, which highlights the bizarre and incredible, as a syndicated newspaper feature back in 1918. As a kid, I remember cherishing the appearance of the weekly cartoon panel in whatever papers carried it. That childish fascination with grotesque humanity has informed the aesthetic sensibilities of many within the gothic, punk and industrial communities. It was an important cornerstone in the all-too-brief existence of the now-defunct Morbid Anatomy Museum, whose exhibitions were featured frequently in the reports of this column. Ignoring the risks that I would be poisoning the minds of our two 4 and 6 year-old little girls, we took them on an outing to the commercialized but still fascinating “odditorium” on Times Square where there were some surprises along with the usual displays related giants, midgets and tattooed individuals. I was pleased that Ripley’s thought enough of old-school punk couture to clothe a couple of manikins with the outfits and tattoos our tiny tots might aspire to wear when they grew to adolescence. Other “teaching moments” occurred when taking the kiddies to tour the medieval torture chamber, the electric chair, Ripley’s collection of shrunken heads and Napoleon’s semi-authentic death mask. They also benefitted from a display case featuring the contents of the recommended kit for hunting and killing vampires. We decided to break out of the gothic-punk-industrial dungeon we normally occupy in order to examine one of the cornerstones of mainstream rock music where it resides and is on full display at the annual music and film festival in Asbury Park NJ. Starting on Thursday night of what unfolded as a four-day weekend oh live performances and film presentations covering everything for which the music scene at the Jersey Shore is famous, adolescent prodigies to Asbury’s own classic rock’n’rollers to a late-blossoming octogenarian blues man. Along the way, and with the aid of some carefully produced and directed documentaries, we were able to piece together a portrait of the unique culture and roots of what makes this town of 16,000 such a legendary location and the breeding ground for its own brand of world-renowned music and culture. 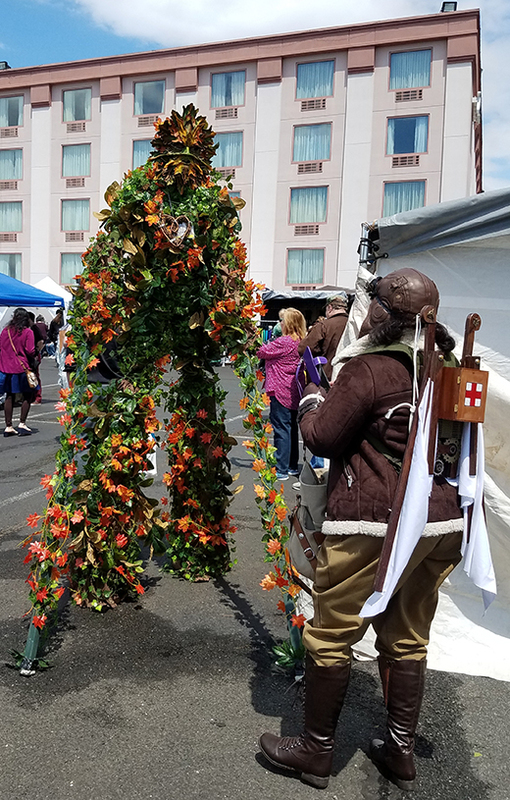 With more than 10 venues and numerous acts and countless peronalities, it would be impossible to report on more than a small fraction of what went on at the APMFF. 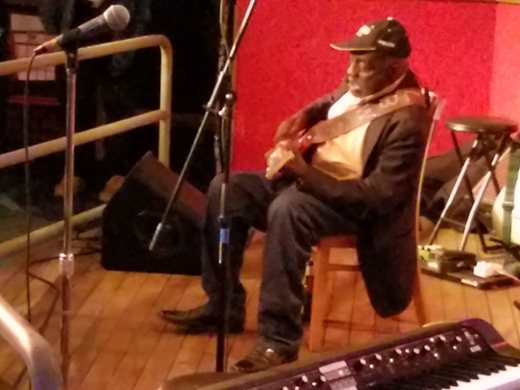 The first event we attended was at the Langosta Lounge where the movie “Late Blossom Blues” traced the recent discovery of a then-81 year-old (now 84) blues man, Leo “Bud” Welch, one of the few living masters of down home, delta blues. Welch is unique in having not been discovered until he was in his 80s. After the screening, Welch moved to Langosta’s performance space and put on a live show that would be near impossible to experience anywhere north of the Mason-Dixon line. The next day, Friday, the documentary “Just Before Dawn” was shown at the cavernous Paramount Theater, situated at the northern end of the boardwalk. Employing creative cinematography and archival footage, it told the story of the Upstairs Club where musicians reconvened, afterhours, to jam and hone their skills after they had finished performing at the many music venues that prevailed in the golden age of Asbury. It was at the Upstairs that famous talents such as Springsteen developed their style and skills. Later we stood cheek-by-jowl with a tightly packed audience at the Stone Pony to see famous pedal steel guitarist Robert Randolph and the Family Band perform some vigorous R & B. 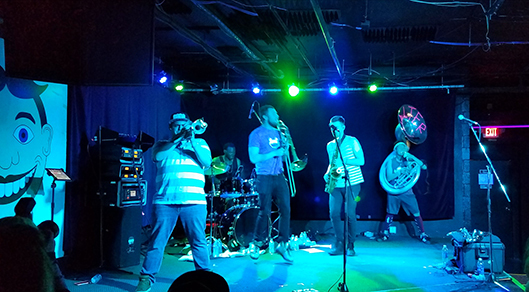 Over at the Wonder Bar, a 5-piece brass band, Lucky Chops performed unbelievably energetic jazz in a manner suggestive of a high school marching band gone wonderfully berserk. On Saturday we sat for a series of film shorts at the Cookman Avenue gallery, Art 629. Entries included an affectionate documentary on the popular cover band, The Nerds, then an eco-minded appeal in “The Pines,” and a positively delightful animation, “Where Do the Seasons Get Their Names” which wound up being named winner of best short film at the festival. One disappointment was the film “Boujeloud; Father of Skins,” which should have told the tale of an Sufi community in Morocco who still honor – musically – the ancient Mediterranean god Pan, but turned into tedious, boring footage of male dancers and musicians playing traditional instruments against a backdrop of women preparing meals by hand. The film “Local Legends” picks up the story of Asbury’s renaissance after the 1970 riots left it in shambles. Dilapidated and boarded up buildings are seen to prevail for the decades of the 80s and the 90s, yet the majestic and monumental, but equally abandoned Conventional Hall, the towering Old Heating Plant and the massive Carousel always hinted at a return to grandeur. In fact, the decrepit environment and cheap real estate fostered an influx of artists, the LGBT and – inevitably – musicians. Veterans, hot-rodders, bikers and photographers collaborated with furniture and antique dealers, investors, clergy, police, and other community leaders. All were connected by music and the town’s musical heritage rendering support to ownership and rehabilitation of music venues, clubs, bars and restaurants. The Asbury Park signature musical sound, cultivated by all night, unpaid jam sessions at the Upstairs, emerged as a hybrid of classic rock, blues and metal that developed from playing covers of top 70s radio hits. 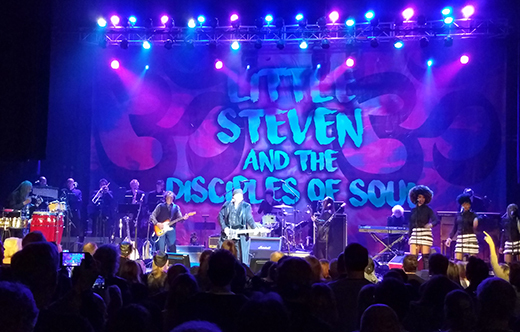 This was brought to life at the APMFF when Little Steven and the Disciples of Soul took the stage at the Paramount, featuring a stadium-sized sound made up of Van Zandt’s vocals accompanied by guitars, bass, drums, native percussion, piano, synthesizer, a 5-piece brass band and 3 soul sister back-up singers. Bruce Springsteen himself, the sainted idol of this community, with whom Van Zandt had long ago collaborated, made an unscheduled appearance and by joining in, endorsed and sanctified the band, the Asbury sound and the festival. Meanwhile, at the Stone Pony, Me First & the Gimme Gimmes performed spoofy, over-the-top covers of saccharine favorites to a packed house, while at the Wonder Bar, Waynard Scheller’s band reprised the jam style and music of the Grateful Dead. Sunday morning gave us an opportunity to check out Danny Clinch’s large format celebrity photographs at Transparent, his studio which also houses Tina Kerekes’ vintage furniture gallery attached to the hotel. Back on Cookman Avenue, at the House of Independents another such group of gifted youngsters calling themselves Morricone Youth performed a live, original soundtrack to accompany an unfortunately glitchy screening of one of the Mad Max movies. On Sunday, the final day at the APMFF, we returned to the Paramount where singer-songwriter, vocalist and harpist Mikaela Davis and her group warmed the sellout crowd with melancholy folk and psychedelic rock chamber music prior to the performance of The Preservation Hall Jazz Band. This venerable New Orleans-based touring group of virtuoso musicians is dedicated to preserving the heritage of original New Orleans jazz. So joyous, so earnest, so captivating was the band that about half the audience rose up and crowded the foot of the stage in overjoyed adulation and rhythmic swaying right through to the end of the show. Final thoughts: A celebration of the history, culture and heritage of Asbury Park and the integration of film into the festival is the right thing to do if this community is to be restored as the gem of the Jersey shore, especially in light of the decline of Atlantic City. 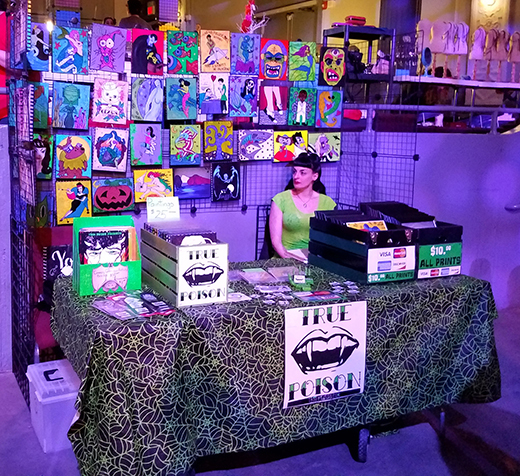 And while the emphasis has to continue to be on the unique place that Asbury and its progeny have in the cultural life of New Jersey, there must be – in future festivals – a further broadening into the musical styles and genres that have emerged from the rest of the world, lest the APMFF become fossilized into stale nostalgia. This is imperative because comparisons are being made in reference to the famous South by Southwest festival. Happily, the attention APMFF gives to young performers and their new interpretations foretells a potentially spectacular future for the festival and the city itself.